We will describe the principles portrayed in these images and offer some sample meditations using the Figure Eight flow of energy. The glyph or visual symbol for this dynamic balance, often called the “infinity sign,” is the Figure Eight. It represents the dynamic and continuous rhythm and flow between polar principles, or opposites. This natural swing from one pole to the other is the rhythm of the Figure Eight flowing back and forth ceaselessly, hence also called the “infinity loop.” If you move your hand in a figure eight motion in front of you, you will feel the swing and momentum that is created by this shape. Contrast it with moving your hand in a circle in front of you and feel the difference in energy and momentum. Balance is something that many spiritual systems talk about. The Figure Eight also helps us understand what balance really means in an energetic context. A spiritual seeker must find balance on the path. Many, in fact, seek a spiritual path like meditation and the like in order to find balance in otherwise imbalanced lives. But what does balance mean? It is often thought of as a static thing, like putting equal amounts of qualities on the pans of a scale until they come to stillness. Or, some systems see balance as being in the middle, the still point itself, where the aspirant is neither one nor the other, detached from both extremes. But from an energetic perspective, there is nothing that is not in motion, dynamic. Without the dynamic magnetism of polarities, energies things run down. So balance is not a static state but a dynamic between energetically polar qualities. The qualities of energy and balance needed to foster and stabilize our spiritual development. The polar qualities that allow us to “open” the chakras, i.e. to bring our consciousness into alignment with those qualities of energy and realms of experience. Let’s just get on to the big picture, that of the polarities of the seven chakras within the Inner Temple. It's truly beautiful. So much form, flow, color. We are drawn to it as if it is something we know, or something we wish to bring some order to our being. What we see here is each chakra, it’s polar magnetic qualities, and our name for the quality engendered by a dynamic balance of both polarities. Behind it all lies the Grand Eight that runs between the Crown chakra and the 1st chakra, centered by the Heart, which represents the connection of matter and spirit and the flow between them. 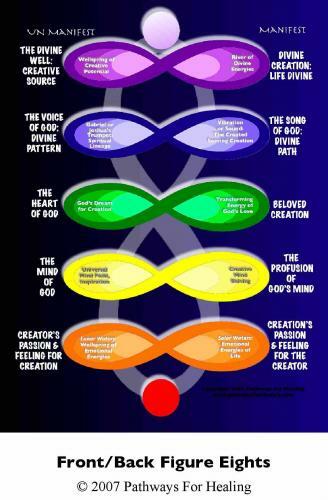 Kabbalists would call this the Involutional and Evolutional pathways, from Spirit to the material existence, and from the most material to the most spiritual direction of evolution of the soul. We will briefly explore the polarities and balance of each chakra in the Temple, and there will be sample-guided meditations at the end of the description. The first chakra is the basis of physical life, and the fundamental energy of the physical body and the physical realm. The red frequency has warmth, hence associated with fire, and a substantial or dense nature. Our vital physical being is generated from the dynamic of the poles of Vibrancy: the deep and hidden Inward Vibrancy in every molecule and cell, and the Outward Vibrancy that expresses itself in Nature’s outpouring. A reflection of this is the hidden, vibrant potential in the seed of the acorn and the activated outward vibrancy seen in it’s sprouting into the oak tree. This quality of inner, hidden potential for vibrancy and growth is inherent in all living things and is a quality of 1st chakra energy in of itself. 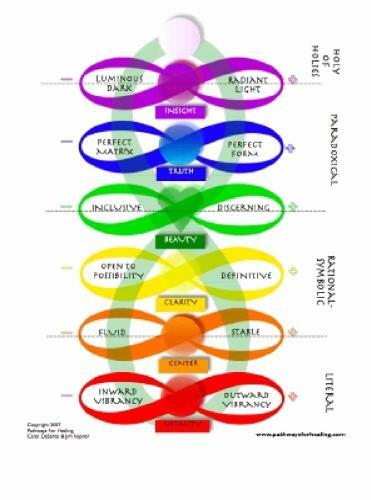 We tend to see only the activated vibrancy as “energy,” yet that is just the expressed pole, the positive magnetic polarity of this inherent potential, as the inward or potential vibrancy is the negative magnetic pole. The particular balance and dynamic of these poles gives each of us our particular nature of Vitality, the balance of dynamic flow between these poles, within our first chakra dimension of consciousness, and our physical being. The second chakra is considered the seat and frequency of emotional consciousness and is likened to the water element. Emotions flow like water, may come in a rush and then they are gone. Water has two polarities: one as a moving water called Fluidity, and the other when it is collected, still and pooled which we call Stability. Without any stabilizing quality emotional energies are rampant and random. Without any fluidity the emotional waters would become stagnant and muddy. The balance achieved by the polar dynamic flow is called Centeredness, and includes the capacity flow with emotions so they can be cleared and cleaned, and contain and stabilize them so they do not displace or control our consciousness. The third chakra is considered the seat of Mental consciousness, and yellow the color or frequency of that realm The third chakra, like the digestive organs within it’s physical location, is the great reducer, breaking experience down into it’s constituents and recombining them in different ways. It is the nature of the Mental to process data (experience). It cannot create data (experience), although when we are purely in the Mental realm we believe we are generating new and fresh data, when we are really just creatively combining what we have already experienced. The Mental likes to think that anything it can think must be so: that ideas are true because one can think them. It does not like to think of itself as limited, especially that there is a Higher and more encompassing reality that it truly cannot conceive of. The polarities of the Mental are Openness to Possibility on the one hand, and Definitiveness on the other. We cannot afford to say “No” to possibility or it will impoverish our thinking. Our mental capacities will have nothing new to process and will only spin in what we already know or repeat what has already been decided. Without Definitiveness, on the other hand, we circle in endless possibilities formulating nothing. If everything is possible, then nothing can be ruled out and no useful order can be found. Ideas are spun but nothing is gained. Clarity comes from the continuing cycles of coming to definitive knowing, then opening to new possibility and building upon what one learned by addition and increased complexity. We are never “Clear,” but rather have periods of Clarity… uncertainty… opening… definition… Clarity… and so on. The Fourth Chakra lies at the crossover of the Grand Eight, and is the meeting point of the mundane world (Physical, Emotional and Mental) and what are collectively called the spiritual realm. It is through the heart center that we have our first capacity to actually experience, not just theorize about, the transpersonal reality beyond our individuated self. The polarities of the Heart center are Inclusiveness and Discernment. The most familiar to spiritual seekers is often the pole of Inclusiveness, the capacity of the Heart to know that all things are included, “All things are equal unto the eyes of the Lord,” or as the Lakota say, “All my relations.” To the Inclusive heart, no person or thing is better than any other, for all belong in Creation, all are gifts of the Creator. But Inclusiveness alone leaves out something important that is also the Heart’s capacity: although in one sense all things are one, it is also true that each thing has it’s own unique nature. Oneness is not sameness. A faculty of the Heart chakra is Discernment, the capacity to “know” the essential unique nature of things, things as they are, not as we wish them to be. This is not to be confused with the 3rd chakra definitiveness. If we have not Discernment our heart is imbalanced. A rattlesnake is, like us, one of the Creator’s creations, and worthy of life and love, but it is also… a rattlesnake! Its nature is to bite when threatened. We include it and love it, but we must also discern its nature, perhaps to love it from a distance! To do otherwise is to violate the fundamental Cosmic Law: Don’t be stupid! Inclusiveness without Discernment becomes a kind of co-dependency, “If I just love him, his essential nature will change…” Discernment without Inclusiveness focuses on the essential nature of something but loses its place in the larger whole. The dynamic balance of these two poles is the quality or state of Beauty, about which little more can be said. As we enter into the spiritual realms of consciousness it becomes more and more difficult, if not impossible, to capture their qualities in words. Edward Cassirer, a linguistic philosopher, said that mystical language can only be a sign post that “points towards” an inexpressible experience, it cannot represent it in the normal sense of language which has reference points in the commonly shared objective world. With that in mind, we will attempt to point to the polarities of the fifth and sixth chakras. The fifth chakra is the seat of the Etheric realm of consciousness, said to be the perfect energetic pattern for all those realms below it. In a way, it is the realm that Plato spoke of when he referred to the Perfect Forms that all material things express in their own imperfect way. The polarities of this realm are called Perfect Form and Perfect Matrix. Perfect Form may be understood as the pattern, as a reflection of the Divine, that give shape or organization to all things. This includes ideas, sense of rightness and truth, as well as the form and functioning of the physical world. Perfect Matrix can be likened to the Yin “stuffness” or dark matter of creation. The Mother Milk which nourishes (builds substance) the manifestation of form. Alchemists referred to this as the Quintessence: Literally “the fifth essence.” These two poles are inextricable, for without Form, Matrix is shapeless, and without Matrix, Form is empty and without substance. Through the fifth chakra we may be able to sense the Etheric and the discrepancy between it and what is manifest (between Higher Truth and what is actual). Thus the centered position in this dynamic balance is referred to as Truth. If the fifth chakra was difficult to render in words, even more is the sixth chakra! The pineal and pituitary, both organs intimately associated with this chakra, need both light and dark to function. Otherwise there is no cycling, no rhythm in the body. Many mystical orders have dark-practices, where the student meditated in completely dark caves or temples for many days, until their inner eye opened and the luminosity hidden within the dark and the radiance of consciousness itself was revealed. It is said of the Void, in many Buddhist traditions, that it is emptiness but luminous in some indefinably mysterious way. All things also have an intrinsic Radiance, a bright glowing forth of the Creative energies shining. These poles of Luminous Dark and Radiant Light create together the dynamic balance of Insight.